Whilst Coloured Diamonds are usually a result of trace elements within the surrounding ore deposits. It is thought the Unique Argyle Diamonds are not coloured as a result of an impurity, but attain their colour as a result of extreme pressure beneath the earth’s surface. Western Australia’s famous Argyle Diamonds have been dated back to more than one billion years. It is understood that the crystal lattice was altered by geological forces to produce a unique structure that absorbs light in such a way that the gem assumes a pink hue. 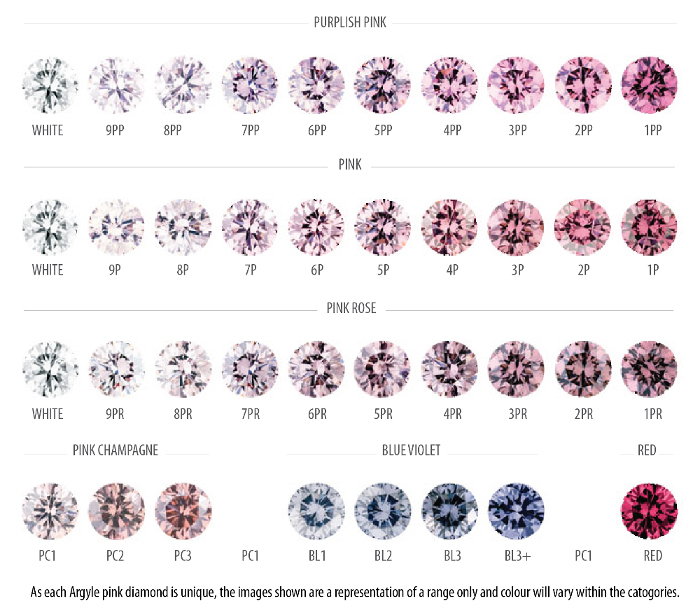 Coloured Argyle Diamonds have their own unique colour grading system. Starting with the rarest Reds , through the pink spectrum of Purple Pink, Pink, Pink Rose and Pink Champagne, the most intense Pinks having a grading of 1 and the lightest of colour being graded a 9. Argyle also produce some very rare and attractive Blue / Violet diamonds which are shown on the colour chart. Hue : Is the dominant colour of the diamond. Sometimes there are modifying colours or tints that affect hue. Tone : Is the amount of lightness or darkness in the diamond. The range of tone extends from light to dark. Saturation : Is the strength or intensity of hue. The saturation of light in diamonds can vary from pastel to vivid and intense. The darker and more intense the colour, the rarer and more valuable the diamond. Nick has a large selection of Argyle Pink and Blue Diamonds set in beautiful pieces of jewellery and as loose diamonds including several Signature Tender Argyle Pink Diamonds.